In a nutshell: A 7" Multi-Touch screen GPS unit (does pinch to zoom like a smart phone). Also has a full feature set of buttons, so all touchscreen functions can be accessed by physical buttons as well. Is compatible with high resolution imagery maps. Includes gps unit, Point-1 Baja external antenna, power cord, goal-post shaped mount, and sun cover. · Easy To See: 7-inch, LED-backlit, multi-touch, SolarMAX™ HD display. SolarMAX™ HD touchscreens produce wider viewing angles from anywhere in sight. Using a unique balance of high-bright LED backlight and advanced anti-reflective coatings along with superior color accuracy and a boosted high-resolution viewing panel, a wider operating temperature range and added moisture-proof optical layers produce clear visibility in any lighting situation. · Simple To Use: Unique Lowrance® interface featuring quick-response touchscreen or keypad control, intuitive software, and protective coatings deliver performance in the most rugged on-the-water conditions. 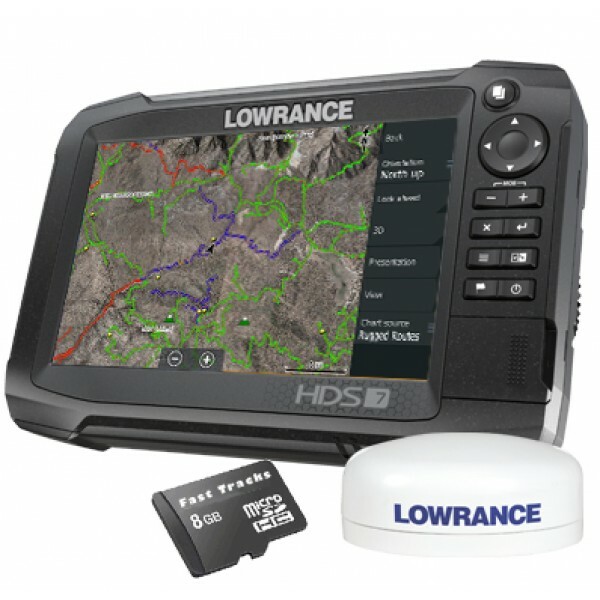 Lightning-fast, fingertip access to all HDS Carbon features. 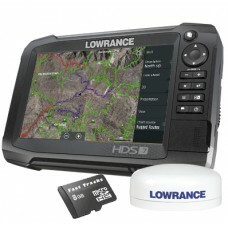 · Dual-Core, High Performance Processor: HDS Carbon employs a dual-core, high performance processor with more than enough agility, speed and power providing faster redraws and quicker response times to easily drive today 's best technology, like StructureScan® 3D, Mercury® VesselView® Link and the Lowrance Outboard pilot. And, it has enough reserve brute strength to drive future high powered fishfinding technologies, too. · Dual-Channel CHIRP Sonar: Coming soon! · Dual Network Sonar Views: Cover more water and mark fish targets more clearly from a network of CHIRP sonar transducers. Watch sonar views from bow-mounted transducer and the in-hull or transom-mounted transducer at the same time on the same display. · Most Advanced Fishfinder Technology: Simultaneously view CHIRP Sonar with StructureScan® 3D or StructureScan® HD to get the best possible view of fish and structure, below and to the sides of your boat. · Quickly Make Adjustments: HDS Carbon has a high performance processor that produces lightning quick redraw speeds and faster sonar updates. It easily powers Carbon 's intuitive user-interface that includes scrolling menus, cursor assist, snap-to setting markers and innovative preview panes with quick-touch slider bars. · Stay Connected: Integrated wireless connectivity with the Lowrance® GoFree® App and other onboard devices, allows you to download software updates and map purchases ─ for immediate use ─ in addition to viewing and/or controlling the display wirelessly using supported tablets and smartphones. · Network All Components: Plug-and-play compatibility with Lowrance performance modules, including Broadband Radar, SonicHub®2 Marine Audio, SiriusXM® Marine Weather and audio, Class B AIS and DSC VHF, as well as industry-leading technologies, like Mercury® VesselView® Link, Bluetooth® control of Power-Pole shallow water anchors equipped with the C-Monster Control System and the SmartSteer™ interface, featuring control of MotorGuide® Xi5 trolling motor and the Lowrance® Outboard Pilot. · Wireless Diagnostic Tools: The Network Analyzer detects devices with out-of-date software, while the Service Assistant allows users to send a detailed report of networked devices to Navico Service for quicker resolution of software/technical issues.